We’re getting ready for our launch evening of the HIYA HIYA Brand at The Woolpatch. Why not come along during the evening sometime and check them out and have a try? Rather than having a set of straight knitting pins across all sizes, and then a set of interchangeable knitting pins and cables across all sizes, with Hiya Hiya, you just need ONE! 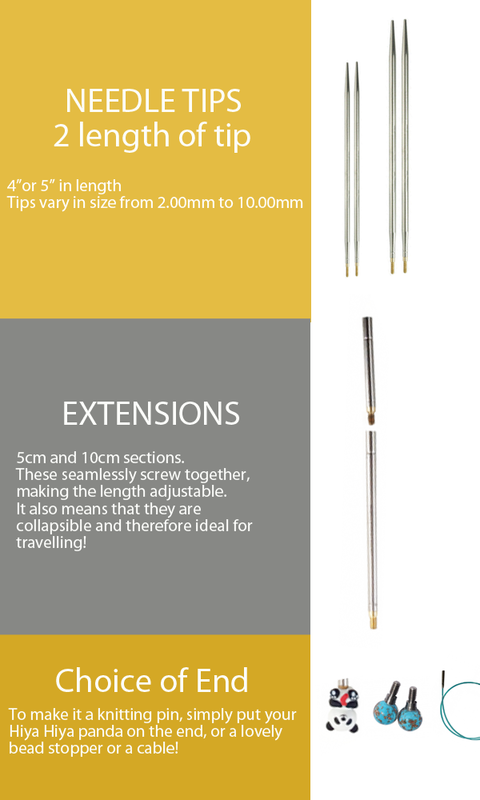 You change your ends to suit your project and preference, from a straight pin end, to a cable end! Incredibly versatile! Mandy will be demonstrating the needles all night, so pop in and see the needles in action and have a go on them! We’ll be putting on drinks and nibbles too! Also, if you need any help with your knitting Mandy can help you out with that too! IT’S ALL FREE! You only have to stay as long as you want to! Drop in anytime. HiyaHiya was first founded in 2002 in Shanghai, China, by a talented designer who loves to knit and her brother and father who are engineers. “I have been knitting for over 40 years and have used many different brands of knitting needle — no single brand met my needs – seamlessly changing from circular to straight or vice versa. Until my husband treated me to a set of Hiya Hiya small needles – WOW my knitting took in new levels. Never again will I be irritated by the ‘catch’ of my yarn as it moves from the cable to the point – Hiya Hiya’s transition is seamless. Nor will I need to search out that particular size of circular needle to be able to continue knitting a shawl, I just swap the straight end for a cable!! Friday 27th April 7pm to 9pm. FREE.